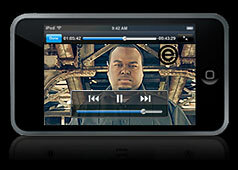 New Orleans-based hip-hop company Eupham announced the end of the year iPod giveaway. "Eupham iPod Touch Giveaway" is the ground floor of a 2008 campaign to promote a new era in hip-hop music. Company chief/artist Lyrikill said the giveaway was implemented to provide exposure to the company’s artists through digital promotion. From October 22, 2007 through January 2, 2008, anyone can register via Eupham’s website to win a "16GB Apple iPod Touch". Eupham will release multidimensional artist Mercure’s album Beyond Good and Evil in early 2008. The release will be followed by albums by emcee Cutta, producer Crummy and Lyrikill. www.elevatedmindsmusic.com/sweepstakes, and submit the proper information. a chance to the 16GB IPod Touch, (retail value $399.00).